Any large system of circulating ocean currents is called a gyre. 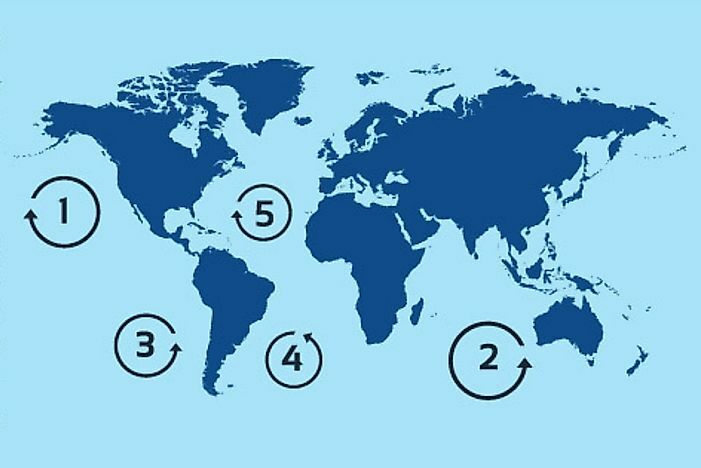 Image depicting the world's largest ocean gyres: (1) North Pacific Gyre, (2) Indian Ocean Gyre, (3) South Pacific Gyre, (4) South Atlantic Gyre, and (5) North Atlantic Gyre. An ocean gyre is a system of ocean currents moving in a circular pattern. They are created by winds formed as the earth rotates and the shifting wind patterns. Ocean gyre is not fixed to a particular point in the ocean but shifts to coincide with the wind patterns. They are known to drive the “ocean conveyor belt” that circulates ocean water across the planet. The ocean conveyor belt also regulates nutrient flow, salinity, and temperature in the oceans. The most notable ocean gyres includes the Indian Ocean Gyre, North Atlantic Gyre, South Atlantic Gyre, North Pacific Gyre, and South Pacific Gyre. Three forces are responsible for creating the gyre; the rotation of the earth, wind patterns, and the Earth landmasses. Wind blow over the surface of the ocean forcing the water to move in the direction it is blowing. The rotation of the earth counteracts the movement of the wind as part of the Coriolis effect. In the Northern Hemisphere, the Coriolis effect deflects the current to the right in a clockwise motion while in the southern hemisphere the currents are deflected to the left in counterclockwise motion. Below the water surface, the Coriolis effect creates the Ekman spiral. The Ekman spiral is formed when currents above the surface are deflected by 45 degrees while the layers below the surface are deflected less as the depth increases. The spiral pattern can descend to about 330 ft below the surface. The three types of ocean gyres are; subpolar, tropical, and subtropical. A subpolar gyre occurs at the polar regions beneath the low atmospheric pressure areas. The Northern Hemisphere experiences gyres. Tropical gyres form closer to the equator. The Coriolis effect does not occur on the equator, and therefore winds are responsible for currents. They currents flow more on the east-west direction rather than on a circular pattern. The Indian Ocean experiences this type of gyre in the form of the southern and northern Indian Ocean Gyres. The subtropical gyres are the most common; they occur between the equatorial and polar regions and circle regions of high atmospheric pressure. Ocean gyre moves in a circular motion over a large area of calm water. Debris carried by the wind and floating on the water drifts into the calm water and accumulate for several years. The region where the debris collects in known as the Garbage Patch. The North Pacific, North Atlantic and the Indian ocean are known to have large garbage trashes. Oceanographers have raised concerned about these patches due to the rising quantity of plastics finding their way into these zones. Plastics are not biodegradable like wood; they instead break down into smaller pieces that are mistaken as food by the fish and thus contaminating the ocean food web. The ocean remains one of the most unexplored parts of the planet. Researchers know very little concerning the oceans including the biodiversity of the ocean gyres. The calm center of the gyre has for long been regarded as a nutrient-poor region due to lack of organic concentrations to support the development of planktons and algae. Research has shown that oligotrophic regions (nutrient-poor region) are expanding in the oceans due to global warming, correlating the previously known fact that warm water contains fewer nutrients compared to cold water.